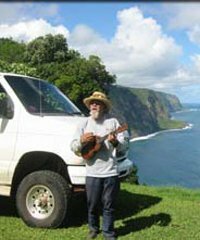 Few sightseeing tours in Hawaii will take you to such remote and beautiful locations as will Waipio Valley Shuttle. 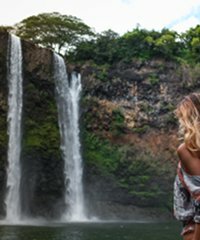 This 4-wheel drive tour, accompanying no more than 10 passengers, will take you on a 1.5 to 2 hour journey to the "Valley of the Kings," the Waipio Valley. Stretching 6 miles in length from mountains to sea, and descending 2000' from its ridges to the valley floor, this valley is considered sacred by the Hawaiians. It was the home of a thriving community of ancient Hawaiians in the days prior to Captain Cook's arrival. This was the summer home of royalty, and was a spot that was flourishing and abundant with wild as well as cultivated crops. 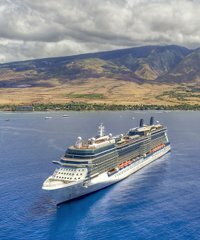 You will see more natural beauty, and perhaps learn more on this short tour than you might on any similar length tour anywhere else in Hawaii.